Greeting card manufacturers are on to a sure winner, aren’t they? These days it seems that there is a celebration or anniversary or special ‘day’ every month, if not fortnight. There are cards for exam passing, retiring, divorcing…you name it, there is a card for it. I’m surprised that there is not a card to say Happy Haywards Heath! Maybe it’s only a matter of time before such a card is on the shelves. But look on the positive side, there is absolutely nothing wrong with celebrating a special occasion. It doesn’t matter what the occasion is, whether a birthday, christening, wedding, anniversary, a card can help you mark the event with a few nice words. But what about something a bit more special? Why not make a party of it and choose Taste the Cracklin’s hog roast hire to help make your party extra special? There’s nothing like a special occasion to put a big smile on people’s faces. A few drinks, a bit of dancing and a lot of laughs can help make for a great day. Great food from a hog roast caterer will guarantee that it’s a tasty event, too. If you are worried that planning such a party or occasion could prove to be a nightmare, then you haven’t taken into account the incredible help that our chef can give you. They really can be your very best friend when organising a hog roast. Leave the food with the hog roast chef and you’ll find that you can really relax and enjoy the party rather than fretting about it. Hog roast really is a superb catering option for any special occasion where great tasting food (and lots of it) is the requirement. And if there are plenty of people coming to your ‘do’ then hog roast is going to keep them very happy. The hog roast chef will make sure that you have enough hog roast to feed over one hundred diners. And if you don’t have that many diners, even better, as it means that everyone can enjoy seconds! Hog roast makes a pleasant change from boring old party food, because let’s face it, we have all been to some great parties where everything has been brilliant apart from the lousy catering. A long table full of the most boring and tasteless party food is so often the weak link in the best parties. Such a shame, because party food should be extra tasty food. That’s what makes hog roast stand out from the crowd because it really is a fantastically tasty meal, full of flavour and full of fun. If you want people to talk about your Haywards Heath party in glowing terms, great food is the key. But it’s not just the taste which is a crowd pleaser, it’s the way in which our chefs cooks the meat too. They’re not simply great at cooking a wonderful hog feast, but also something of a frustrated entertainer, and that could explain why they love their job so much. 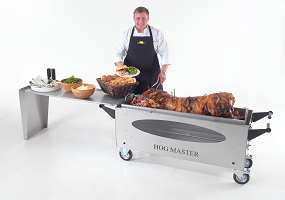 The hog roast chef is a show off and with good reason, because the whole pig is cooked for all to see on the rather smart but highly effective hog roast machine. It’s a wonderful sight to see your meal being cooked right in front of you and not something you get to enjoy very often. It’s a bit like a classy take on the barbecue principle but this looks and tastes miles better. This cooking (which will have been started in advance of your event) takes around six long hours. This helps guarantee some of the very best tasting meat that you will ever sink your teeth into, not just at a party but anywhere. And as for the meat that’s being cooked, well there are no corners being cut there either. The hog roast chef choose only the very best whole pigs that they can find from the best suppliers. With quality meat you can almost be sure of getting some of the very flavours available. Combine that with a good hog roast chef and you are in line for some great food. If you are planning ahead for a special Haywards Heath occasion, don’t waste your time mulling over what catering option to go for. There really is only one perfect solution and that is choosing a Haywards Heath hog roast chef from taste the Cracklin. Going the whole hog is worth it!